Being a working girl living in the city, one of the challenges is finding healthy food to eat everyday. I work on night shifts, so I practically sleep all day and by the time I wake up, I've got just enough time to prepare myself for the workday ahead. Most of the time, before going home or before sleeping, I either have something delivered or buy something on the way home. It's always a dilemma finding a healthier food option everyday. Although far from being the healthiest choice, fast food remains at the top of my list as my popular choice because it’s readily available. Maybe that's why we always resort to these quick fixes because they are available everywhere, even be delivered right at your doorstep. But they are known to often be high in sugar, fat, and calories while containing minimal nutrients. So guilty here! 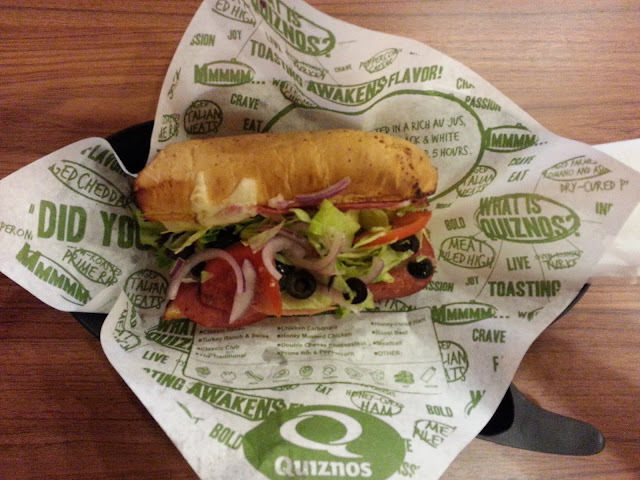 It's a good thing Denver, Colorado-based sandwich restaurant, Quiznos, has partnered with the ACA Group and recently introduced the celebrated toasted and healthy sandwiches in the Philippines. 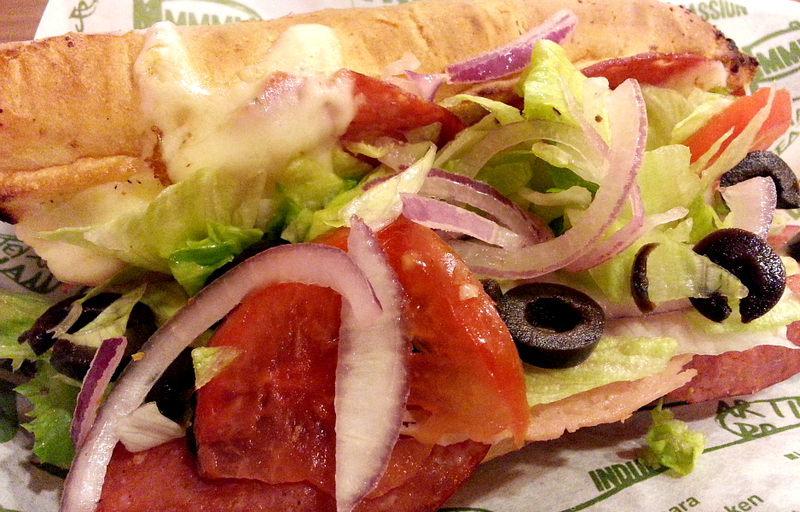 I was able to visit a Quiznos branch about a month ago when I was looking for a healthy option while in Shangri La mall. Been seeing tarps of Quiznos around Makati so it got me a bit curious. The place is located at the basement, it's straightforward, nothing fancy. Walls painted in bright colors, there's also high chairs if you prefer them. I got there around 11 AM just in time as the mall opened so the place was almost empty when I placed my order. Since I am not familiar with their offerings, I asked what the staff would recommend. She gave me quite a few options (Classics and Signatures) and also informed me about the sizes. Apparently, there's 5", 8" and 11". That's small, regular and large, respectively. She even brought out a green cutting board of sorts with grooves that indicated the length of the above mentioned sizes. I settled for an 8" Classic Itallian (yes, it's spelled that way) which includes Capicola, Salami, Ham, Pepperoni, Mozzarella, Lettuce, Black Olives, Tomatoes, Red Onion and Red Wine Vinaigrette. You will also be asked what type of bread you'd like. The choices are Artisan Wheat, Italian White or Rosemary Parmesan. I chose Italian White. It really tasted good! The ingredients used were fresh and tasty, I really enjoyed it. The bread's slightly burnt edges were just the perfect crunch but the middle was chewy and delicious. I admit, it was indeed a mouthful (haha), a bit hard to bite at first for a lady like me (lol) but it was worth it because it was delicious and compared to others, it was healthier. To make the offerings more enticing to the Filipinos, Quiznos adapted menus to fit the Filipino taste (i.e., Adobo Pork Flat Bread!) Besides the toasted subs, they added grilled flatbreads, salads, and sub sliders to the menu. This shows the commitment of Quiznos and the ACA Group to expand and build its brand equity in the country. Furthermore, Quiznos is bullish on the Philippine market citing the fondness of Filipinos for eating and warm acceptance of American food. Quiznos Philippines plans to open 250 stores in five years. 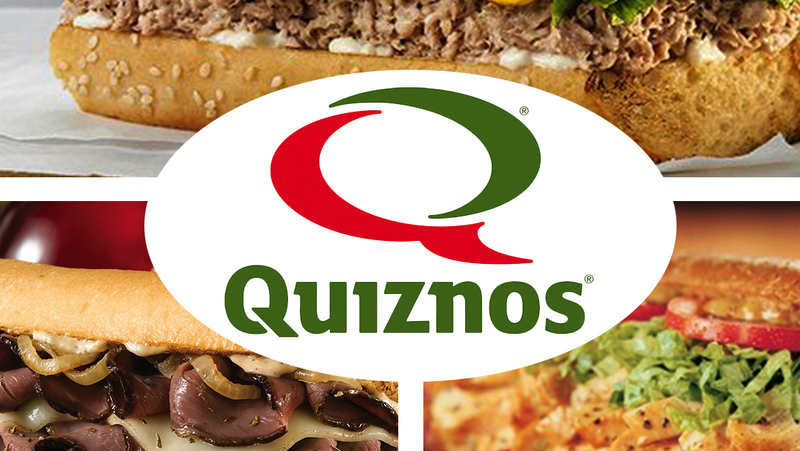 Quiznos has a solid partner in the ACA Group because the latter has an excellent track record in successfully launching brands and sustaining a strong network of business owners and franchisers. The partnership between the two organizations combines their core competencies in international food expertise and local franchising experience, respectively. Founded more than 30 years ago, Quiznos will take eating sandwich to a higher level with butcher-quality meats, all-natural cheeses, chef-designed signature sauces, and toasted artisan bread. 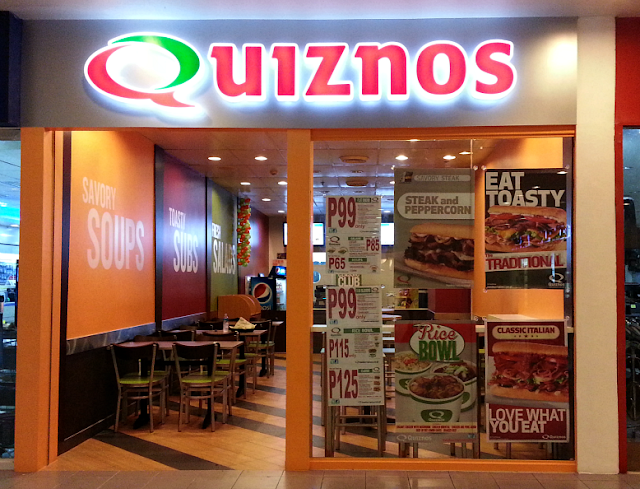 Quiznos can be found in Bonifacio High Street, Taguig City; Eastwood, Quezon City; Greenbelt 3, Makati; Alabang Town Center, Muntinlupa; Regis Center, Katipunan Avenue; Shangri La Plaza, Mandaluyong; Robinsons Magnolia, Aurora Boulevard and Venice Piazza McKinley. Media Relations Officer, PRC Inc. Thank you featuring our cupcakes in your weekend dessert finds! Would like to apologize for the inconvenience. Our breakfast is temporarily unavailable as of now and will be launched in a month or so as we are currently concocting more exciting recipes and selections. We have updated the operating hours on the website (Sun- Thurs 11am-11pm, Fri & Sat 11am-1am). We very much appreciate your comments and will definitely take note of all of them. Thanks again and hope to see you again soon! You will definitely see me soon! :) Can't wait to try your breakfast food!